Fisker surprise announcements scheduled for LA Auto Show: Fisker Automotive’s co-founder and former CEO has come back on the scene for the first time after quitting, and later attempting to acquire, his extended-range sporty luxury car company last year. Henrik Fisker says he’ll be unveling two new cars on November 20, a media day at next month’s LA Auto Show. Back-to-back press conferences are scheduled with no details yet revealed, except for the fact that they’re being sponsored by the mega-Ford dealer Galpin. The first session will be taking place with Galpin Auto Sports, the dealer chain’s custom-car division and the other session will be hosted by Galpin Motors. One of them is predicted to be more of a muscle car than an environmentally sound, fuel-efficient model. Fisker has been known to be quite a designer, overseeing the BMW Z8 and Aston Martin V8 Vantage sports cars, plus a few others. 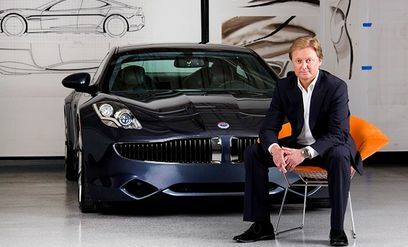 One of his other businesses has been Fisker Coachbuild, which made restyled versions of the BMW and Mercedes-Benz luxury cars. Toyota and Daimler have sold off some, or all, their stock shares in Tesla Motors. Daimler made big gains of selling off its remaining 4% shares and bringing in $780 million from its original $50 million stake. Toyota didn’t reveal the timimg or amount of its latest sale. Its initial investment of $50 million gave it 2.5% share in the company in May 2010. While the Toyota RAV4 battery and motor deal is ending later this year between Toyota and Tesla, their relations appear to be solid. Tesla CEO Elon Musk said the company would sign a new deal with Toyota in the next two-to-three years. Daimler and Toyota were likely taking advantage of the extremely high value of Tesla shares – closing yesterday at $221.67. Sierra Club releases tool for EV shoppers. The Sierra Club is now offering car shoppers its “pick-a-plug-in” website tool to find the right electric vehicle (EV) for them. Pick-a-plug-in asks the user a few questions about driving habits and vehicle needs, and then generates a list of EVs that fit the bill. There’s no recommended car featured, but leading models are given based on how many miles a day the person drives, whether the person takes frequent long trips, whether there is a place to plug in the car, and how much money the person is prepared to spend. ChargePoint says you can pay for your charge on PayPal. While over half the 19,000 chargers in the ChargePoint network are free, the company is now moving forward in the payment process. ChargePoint employees at its San Jose, Calif., campus, can go to 34 charging ports and pay for ChargePoint with PayPal. This must be entertaining for Tesla Motors CEO Elon Musk, a former PayPay co-founder. GM adds to its sustainability credentials with more solar. Along with its landfill-free facilities, General Motors is adding to its solar power. A new 2.2 megawatt, ground-mounted solar array will be set up by the end of this year at its assembly plant in Lordstown, Ohio. Once the last of the more than 8,500 solar panels are in place, it will be GM’s largest solar installation in the western hemisphere, the automaker said. Navigant Research expects EV growth, though not an easy one. Navigant Research expects the global light-duty electric vehicle (EV) growth to be sizable – from 2.7 million sold in 2014 to 6.4 million in 2023. These numbers include hybrids, plug-in hybrids, and battery electric vehicles. That growth rate will take a lot of hard work, according to the study, with much competition coming from automakers producing more fuel effient internal combustion engine vehicles. Stop-start technologies, lightweight materials, engine downsizing, and growing interest in clean diesel, is putting the pressure on OEMs to reach the level they’re stiving for in electrified vehicle sales. Smart parking tools available through ParkMe and Microsoft. For those of you affected by “urban mobility” (carsharing, ridesharing, e-bikes, parking, etc. ), there was an interesting announcement made by ParkMe, which is probably the largest provider of real-time parking data to car owners through the mobile devices. ParkMe will provide parking data to Microsoft Corp. to be integrated into its Bing search engine. Users will be better able to access smart parking tools to find nearby parking, check real-time availability, and pre-pay for the cheapest and most convenient parking at their destinations. Telsa and US Bank offering cheaper lease payments. Tesla CEO Elon Musk just wrote in the company’s blog how the agreement with the major bank can lower monthly lease payments by as much as 25% on a new Model S. Another perk: the Tesla happiness guarantee. 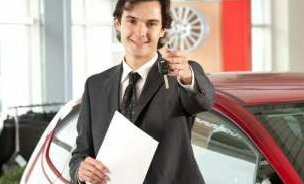 If you don’t like the car for any reason in the first three months, you can return it and the lease obligation is waived. “The only catch is that you can’t then immediately lease another Model S,” Musk wrote. Brazil loves biofuels but holding back on EVs. The Brazilian government just released a green-car incentives programs that excludes battery electric and plug-in hybrid vehicles. Import duties are cut on new hybrid cars, though that does not include tax breaks or other perks. Electric vehicles are excluded entirely because the country’s electricity grid doesn’t have the capacity to handle an influx of EVs and all the charging they need. Recent droughts have lowered water levels in the dams that power hydro-electric electricit plants. Brazil has had to look for other methods of electricity generation. Not long ago, I wrote about a sticking point I’ve had for a long time – it’s not all about California electric vehicle sales for bringing zero emission vehicles to US roads. Well, I may have been wrong about some of it……. California does lead the way in collaborative projects between government, industry, and non-profits organizations. Here are a few clear examples…………. The governor’s Office of Business and Economic Development (GO-Biz) and the Japanese government organization New Energy and Industrial Technology Development Organization (NEDO) agreed last week to conduct a feasibility study for an electric vehicle (EV) demonstration project to develop new fast charging EV stations in California. During the roughly half-year feasibility study, NEDO in coordination with GO-Biz will develop a detailed plan for the possible demonstration project. It comes from a memorandum signed by the two governments in September on climate change, renewable energy, vehicles, and other issues. Major utility NRG’s eVgo company has installed what it says is the largest corporate deployment of EV charging stations in Southern California – 60 Level 2 workplace charging stations at Sony Pictures Entertainment’s historic facility in Culver City. Sony began offering incentives to employees in 2008 to buy EVs, and so far 300 employees have done so. The Ready for Electric Vehicle (REV) program provides Sony and other workplaces with turnkey EV charging solutions, providing charger maintenance and driver support. An impressive meeting took place Thursday at the South Coast Air Quality Management District office in Diamond Bar. Officials from eight states say their country is on track to have 3.3 million zero-emission vehicles on the road by 2025 – with about 1.5 million of them in California. Beyond a vivid display of a wide range of Evs in its parking lot, officials from members of the multi-state EV task force praised California and talked about what’s been accomplished in their states. A commissioner with the Massachusetts Department of Environmental Protection said that Evs are playing a vital role in his state’s goal of dropping green house gas emissions to 25 percent below 1990 levels by 2020. While I would still love to see other states embrace EVs, California is leading the way. That’s also true for natural gas vehicles, hybrids, and hydrogen fuel cell vehicles (which fall under the zero-emission vehicle category). I think there are three other reasons why California is leading the pack: plentiful funding programs through California Energy Commision and other state sources; university think tanks such as the UC Davis Plug-in Hybrid & Electric Vehicle Research Center with its excellent study on dealerships and EVs; and California Air Resources Board is up there with the US Environmental Protection Agency for certification standards governing OEMs in alternative fuel vehicles including natural gas and propane autogas. Sales of electric vehicles (EVs) have been fairly impressive since their launch in late 2010, but the question of how to move those numbers up continues to plague the auto industry. A new working paper and brief by researchers at the Institute of Transportation Studies, UC Davis explores the issues. Aside from Tesla buyers, car shoppers and buyers of EVs are much less satisfied with the dealer purchase experience than are buyers of conventional vehicles. EV buyers have been dissatisfied with the level of support they receive from dealerships. The UC Davis team sees that EVs require innovation in how they’re retailed to customers during a time of change in what consumers expect from their car shopping and buying experiences. There’s a real need for a dealer training program to enhance the EV car shopping and buying experience – and Green Auto Market has a proposal on how to get that done. Earlier this year, a Consumer Reports investigation came to similar conclusions. The magazine dispatched 19 mystery shoppers to 85 dealers across four states. One finding was that dealer staff knew little about the EVs they’re selling. In some instances, dealer staff discouraged EV purchases. The UC Davis team conducted 43 interviews with six automakers and 20 new car dealers in California’s major metro markets for EV sales. They also analyzed national and state-level J.D. Power 2013 Sales Satisfaction Index (SSI) study data on customer satisfaction with new car dealerships and Tesla stores. One of the challenges for EV success is that these vehicles need to be offered outside of California. Currently, 19 different EV models from 10 different automakers are available for purchase in California, but only three of these models are available nationally. While automakers have their part in getting national EV sales above and beyond 1% of all new vehicle sales, dealers play a very large part in meeting this goal. Legal battles between dealer associations and Tesla Motors present a real challenge for dealers to compete, but also an opportunity for franchised dealers to stand out. Nearly every automaker is offering an EV for sale now. It can be challenging for dealer management to get their sales representatives focused on selling EVs; they do need to spend more time these days answering car shopper questions on connectivity, infotainment, extended warranty coverage, etc. It might be attractive for a dealer sales rep to get the car shopper to focus on something other than EVs, especially if it takes a long time to answer their questions – and if the customer knows more about EVs than the sales rep. It would probably make the most sense to have a training program for dealer staff available on video with other presentation materials, such as a slide show and hand-outs. Whatever the method, it’s becoming more important now for the dealer experience to improve for EV shoppers – if automakers and dealers want to see those sale numbers increase and to build customer loyalty. For anyone interested in exploring this opportunity, I encourage you to send me an email. Clean transportation has a symbiotic relationship with environmental groups. There is a wide gap between the business side and the environmental activist side on certain issues, but the crossover in common interests does show up on a regular basis. That can show up as lobbying for government clean vehicle funding programs, public awareness and education campaigns, reducing vehicle emissions, and debating the oil industry. If you’ve attended Clean Cities meetings and alternative fuel vehicle events, you’ve probably met a few of these environmental activists – many of whom drive hybrids and electric vehicles. Some of them participate on speaker panels. They may also be serving in an executive role in cleantech businesses like solar power installers, or in management at a government agency overseeing environmental issues like air quality and waste management. All that being said, Green Auto Market – Extended Edition is now featuring a six-point guide to getting the most out of these relationships to further the cause of clean transportation. For those interested in getting a subscription and reading this article, visit this site. Here are the six points covered in detail in this article……. Support a moderate, deal-making approach – There may be one or two environmental issues that a clean transportation industry group or company supports, but five or six they don’t. Finding those common causes can support getting something passed through a legislature and other gains the clean transportation industry needs to see happen. Know their advocacy issues – The article presents a list of top priority issues that you’ll see in environmental group email marketing campaigns, public protests, petition signings, celebrity statements, lawsuits, and other tactics. It’s good to stay informed on these issues as they move through the political maze. Know the basics on leading environmental groups – A who’s who list with information to help you become familiar with these groups and to meet their leadership at events you’re attending. Support clean energy/cleantech jobs and economic growth – Groups see clean transportation as a vital segment in their sustainability campaigns – with economic benefits a large part in gaining their support. 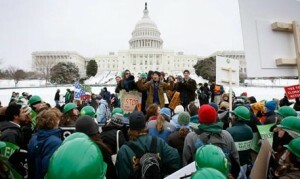 It makes for a convincing argument to gain more support from environmental groups, companies, governments, investors, and from the public, in this day and age of several US industries dwindling and more jobs going overseas. Understand the types of vehicles and transportation they support –Electric vehicles tend to gain the most support from environmental groups – representing freedom from oil addiction, and energy that can be produced through clean sources. Hybrids have been popular, too, with environmentalists, especially the Toyota Prius. Beyond EVs and hybrids, environmental groups tend to be supportive of, and impressed by, fleets deploying EVs and other alternative fuel vehicles. They also support a number of transportation policies in cities across the country. Have a “fracking” policy in place –Fracking so far hasn’t yet hurt support for natural gas vehicles, but it is a growing issue of debate and political and legal battles in several states.Controlling water usage and methane mitigation have been the focus of recent studies by academic and environmental groups that have emphasized making fracking a viable and responsible technique for cleaner natural gas extraction and storage. The federal government is moving closer to having more standards in place on fracking, and companies serving transportation and energy markets would be wise to adopt sound and practical policies. Tesla Motors is masterful at getting people to impatiently wait for the electric carmaker to unveil a new technology. 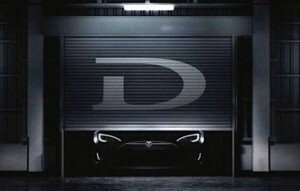 The “D” model announced on Thursday wasn’t a new electric car, but an all-wheel drive version of the Model S that will roll out in 2015. It will offer a semi-autonomous driving system that it calls Autopilot. Cameras and infrared sensors read speed limit signs and the speed of cars around the Model S; it also features collision avoidance and lane-keeping assist systems. Drivers can change lanes simply by switching on the turn signal. Tesla says Autopilot is able to park the car once you leave it. The Model S 85D will have 295 miles of range compared to 261 for the ordinary Model S, and it will be more energy efficient than previous versions of the Model S. “A system like this is inherently able to achieve better road holding,” Tesla CEO Elon Musk wrote in the company’s blog. “We were able to improve almost everything about the car.” Some media and stock market analysts found the hyped announcement to be overinflated; others have been fascinated. More DOE funding rolling out. As part of its $25 billion Advanced Technology Vehicle Manufacturing (ATVM) low-interest loan program, the US Department of Energy may soon be awarding new loans. These new loans will probably go to parts suppliers and not OEMs, with one or two awards expected to be announced this year. Lighter-weight materials for fuel efficiency, such as aluminum alloy, may be part of the low-interest loans. There have been no new ATVM loans since late 2011, with more than $15 billion remaining in the coffer. Another plug-in hybrid Cadillac. Cadillac will debut a plug-in hybrid version of its CT6 large sedan late next year, according to product chief Mark Reuss. It will get at least 70 mpg. The next CT6 will have a wide range of advanced technologies available – a six-cylinder turbocharged engine that goes up to 400 hp, a stop-start system, and an eight-speed automatic transmission. Lightweight construction will also help fuel economy, Reuss said – it’s going to be eight inches longer and 53 pounds lighter than the Cadillac CTS. Cadillac also has a battery electric sedan in the planning stages. Green vehicle awards increasing even more. As reported in Green Auto Market two weeks ago, annual green vehicle awards are getting a bit more confusing. Along with Bobit Business Media adding the Green Fleet Car and Truck of the Year Awards during Connected Car Expo at the LA Auto Show, the annual Green Car of the Year award will be announced that same day by Green Car Journal. That magazine has started up another contest – the Green Truck of the Year award, which will be presented at the 2014 San Antonio Auto & Truck Show on November 6. The five nominated 2015 model pickups include the Chevrolet Colorado, Ford F-150, GMC Canyon, Ram 1500 EcoDiesel, and Ram 1500 HFE. “The significant efficiency and environmental improvements being made in the truck segment signal an important change in the industry,” said Ron Cogan, publisher of Green Car Journal and CarsOfChange.com. Maybe Green Auto Market should start its own award? Green Vehicle Innovations of the Year Award, or something like that? New NGVA leader takes the helm. Natural Gas Vehicles for America has named Matthew Godlewski its new president. Godlewski succeeds Rich Kolodziej, who served as NGVAmerica’s president since 1996. Godlewski is an experienced trade association executive who has a proven ability to lead effective teams and collaborate with industry allies, said Ron Eickelman, chairman of NGVAmerica and president of Agility Fuel Systems. Statements of support have been released by a few colleagues, including Mitch Bainwol, president and CEO of Alliance of Automobile Manufacturers (where Godlewski had served in a leadership role), Andrew Littlefair, president and CEO of Clean Energy Fuels, Scott Perry, VP of supply management for Ryder Fleet Management Solutions, and Gordon Exel, president of Cummins Wesport. Tesla Motors has opened up in a tough-to-enter market. Tesla Motors has opened up a retail store in a country that usually doesn’t allow outside automakers to sell domestically – Japan. Last month, Tesla CEO Elon Musk handed over keys to several new Model S owners during a ceremony in Tokyo. Musk praised Japanese electronics company Panasonic for supplying the battery pack in the Model S. One of these cars was delivered to Yoshi Yamada, a Panasonic executive vice president; Yamada said the Model S is only being taken for company use. Zero emission buses had two major announcements. CALSTART has been given approval by the Federal Transit Administration to develop North America’s first-ever fuel cell/battery combination zero emission 60-foot electric bus. The bus will be built by New Flyer Industries, and it will be designed to provide daily urban service using a unique combination of fuel cell and batteries. The propulsion system will include a combination of batteries, a fuel cell, and hydrogen storage. The bus is expected to be completed in the middle of next year……… China-based BYD says it will unveil the world’s first pure battery electric 60-foot transit bus at the APTA Expo in Houston this month. The company said that representatives of major transit agencies have visited BYD’s factory in Lancaster, Calif., to see the electric bus. SolarCity and Honda investing in solar power. During the SXSW Eco conference in Austin, Texas, SolarCity and Honda renewed their partnership with a new fund expected to finance $50 million in solar projects. The idea is to make solar more affordable and available to Honda and Acura customers and dealerships in the US. This fund is a follow-up to a $65 million fund the two companies created in 2013. They’ve completed their first wave of solar projects for homeowners, dealerships, and corporate facilities that now produces more than 12.5 MW of solar generation capacity. Fuel economy pace slows down. The US Environmental Protection Agency (EPA) released its annual Fuel Economy Trends report. Average fuel economy increased to a record 24.1 mpg in the 2013 model year, a pace that slowed down compared to the two previous years. It saw a 0.5 mpg increase from the previous year, while the 2012 result had improved 1.2 mpg from the prior year. It’s expected to slow down even more – to just a 0.1 mpg increase for the 2014 model year. Federal regulators say – not to worry. They expect the pace to go back up as more powerful gasoline-saving technologies enter the market. Give renewable natural gas the recognition it deserves. Joanna Underwood, president of Energy Vision, just had commentary pieces published in Triple Pundit and GreenBiz. Turning biogases into fuel has a dramatic impact. Fleets converting from diesel to renewable natural gas cut greenhouse gas emissions by 88% or higher. This exceeds U.S. goals of a 20% reduction by 2020 and an 80% reduction by 2050, Underwood wrote. Cheaper, lighter, high-density lithium batteries: How close are we? Lithium ion batteries are coming down in cost, but it’s all relative. Here’s a clear example…… The starting price on the Tesla Model S with a 60 kilowatt hours (60 kWh) lithium battery is $68,710; and the price goes up to $83,760 for the Model S with the 85 kWh option. The battery pack in a Model S costs about $30,000. Analysts carefully watch what’s happening to the cost of lithium batteries, their weight, size, and storage capacity. Building a smaller, lighter and cheaper battery for Tesla’s upcoming lower-cost sedan has been at the heart of its $5 billion “Gigafactory” in Reno, Nev.
It’s going to take a few model years to see the price drop substantially. Here are some of the latest developments in electric vehicle batteries………. Sakti3 says that its solid-state cell is close to doubling the energy density of today’s lithium-ion cell chemistries, at only one-fifth of their current cost. That technology will support a battery cost of just $100 per kWh – but that won’t be happening until the end of this decade. Satki3, led by University of Michigan engineering professor Ann Marie Sastry, has received investment capital from GM Ventures. That goes back to 2010, when Sakti3 received a lot of media coverage and exposure (such as Sastry speaking at the Bloomberg symposium in Los Angeles during the time the Nissan Leaf and Chevy Volt were first being delivered to dealers in December 2010). The company went under the radar for a few years and has reemerged, with a recent article coming out in Fortune on the company. Panasonic has created a new company to oversee its operations at the Gigafactory as it goes online over the next two years. Panasonic has made an initial investment of $92 million, and that payment is expected to be the first of many cash infusions. Tesla Motors CEO Elon Musk says that as many as 500,000 battery packs per year could be built there by 2020. Tesla management will be in charge of the factory; Panasonic will provide the necessary manufacturing equipment and lithium-ion battery components. Along with federal and state incentives and low-interest loan programs, companies in clean transportation lately have been finding more available investment funds in the cleantech sector. Cleantech covers a broad spectrum of environmentally friendly, advanced technologies including zero emission vehicles, waste-to-energy, renewable energy, smart grids, and energy efficiency. Last week, I attended the CleanTech OC 2014 Annual Conference & Expo in Irvine, Calif. Clean transportation played a visible role including being the focus of the first speaker panel that day. The “Cleantech Drivers –What Hot in OC” panel started with Tim Brown, co-founder and COO of First Element Fuel, which has been awarded contracts to deploy hydrogen fueling stations in California. Several more stations will be set up in the next year, usually at standing retail fuel stations. Right now, there are seven hydrogen stations in California; three of them are in Orange County. Tom Koutroulis, district manager for Waste Management, talked about the refuse disposal company’s Continuous Organics Recycling (CORe) “wasted food, wasted energy” program. The company uses anaerobic digesters to manage waste and produce fuels. Waste Management works with agencies such as Los Angeles and Orange County sanitation districts to recycle and convert food waste into energy, such as renewable natural gas, and is setting up operations around the country. 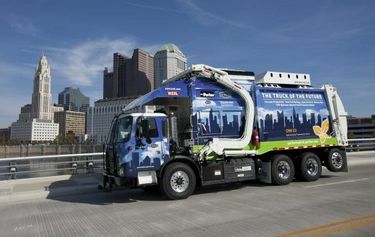 CORe ties into the refuse company’s campaign to reduce use of fossil fuels, which also includes switching over its fleet to natural gas vehicles. Harrison Clay, president of Clean Energy Renewable Fuels, described the natural gas fueling infrastructure company’s renewable natural gas division as providing “expanding opportunities for low carbon fleet fueling.” Parent company Clean Energy Fuels now has about 700 fleet clients running about 35,000 vehicles on traditional and renewable natural gas. There are about 2,000 trucks in the Long Beach and Los Angeles ports using natural gas, with several trying out biomethane through Clean Energy’s Redeem brand renewable natural gas. The Low Carbon Fuel Standard (LCFS) in California is a big driver in fleets becoming more interested in renewable natural gas. There have been about $10 million in LCFS credits sold for biomethane on the state’s cap-and-trade market, Clay said. Fleets using traditional natural gas are seeing significant reductions in metric tons of greenhouse gas emissions (GHG) compared to gasoline and diesel; using renewable natural gas reduces GHG four times more than traditional natural gas as a vehicle fuel, he said. The federal Renewable Fuel Standard Program and California’s LCFS are growth drivers for renewable natural gas with about 20 million gallons being delivered this year – a number which should double in 2015 based on supply sources that have already signed up. One problem is that the LCFS carbon credit market can fluctuate dramatically and is an uncertain market, Clay said. Dean Saito of South Coast Air Quality Management District said that there are a lot of cap-and-trade funds coming out of Sacramento lately. Cap and trade started in 2006 with passage of AB 32 in California under then-Governor Arnold Schwarzenegger. LCFS was also created under AB 32. It’s taken a few years for the cap-and-trade exchange market to get underway; and implementation of LCFS rules for transportation and oil production are still undergoing review and public feedback by the California Air Resources Board. Saito encouraged people to track California clean vehicle funding programs – Clean Fuels Program; Goods (freight) Movement Program; Carl Moyer Memorial Air Quality Standards Attainment Program; Lower-Emission School Bus Program; and Enhanced Fleet Modernization Program. One of the keynote speakers at the day-long conference was Greg Trimarche, outgoing chairperson of CleanTech OC. He said that the cleantech industry is going through a market trend similar to what was experienced by high tech in the early 2000s. What had been very hot on the stock market and with private investors went through a shakedown during 2001-to-2002. Cleantech saw a flood of investments from 2008 to 2010, until huge losses taken by companies including Solyndra became a “political football,” he said. Cleantech isn’t a hot-ticket item now for venture capitalists, but it’s seeing a more stable foundation for capital investments as analysts see which companies have survived the startup phase and look good for long-term investments. Two days prior to the CleanTech OC conference, on October 6, another significant cleantech industry event took place. The 2014 Global Cleantech 100 companies were announced at a gala in Washington, D.C. Global Cleantech 100 is an annual list of the top 100 private companies in clean technology determined by Cleantech Group. Five US-based companies took awards in the Transportation segment – ChargePoint and its network of electric vehicle charging solutions; Proterra, a maker of battery-powered buses and other clean commercial transit solutions; RelayRides, a developer of a peer-to-peer car sharing platform; Streetline – smart parking solutions through wireless sensors located in parking spots and managed through a wireless mesh network; and Uber, the mobile-based car booking and payment system that’s arch enemy No. 1 to the taxi industry. 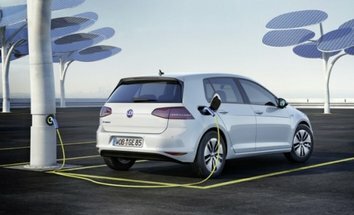 Outside the US, France-based BlaBlaCar, a provider of a car-pooling online marketplace, and Germany-based Ubitricity, a developer and provider of a mobile metering technology and billing platform for EV smart charging infrastructure, also made the transportation list. Nissan Leaf continues to lead the pack. Electric vehicle sales saw a little bit of softening in September after two months of strong numbers – falling short of the recent 10,000 per month mark with 9,340 units sold last month. That was 15% greater than one year earlier; for the year, 88,149 units have been sold – a 30% gain over the first nine months of 2013. The Nissan Leaf continues to steam along, reaching its 19th consecutive month of year-over-year increases. Hitting 2,881 units sold last month was nearly a 50% gain over last year’s 1,953. The Chevy Volt didn’t do as well – hitting 1,394, its lowest sales number since February and down from September 2013’s 1,766. The new 2016 Volt will be rolled out at the Detroit Auto Show in January, and current sales are expected to remain down for 2014 and 2015 models. The Tesla Model S isn’t reported but was expected to sell about 1,300 last month. Right behind the Model S is the BMW i3, which sold 1,022 last month – its second month over 1,000 sold. 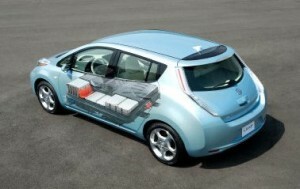 The company expects to roll out a higher share of i electric and plug-in hybrid models in the US in coming months. Tesla has raised interest with CEO Elon Musk’s recent tweet about unveiling its mysterious Model D on Oct. 9. Tesla also gained interest in its used car remarketing strategy in an Automotive News feature article. Tesla is developing a certified pre-owned (CPO) vehicle program for its off-lease Model S units. That should make it more competitive with pre-owned luxury models from BMW and Mercedes-Benz, the company said. EVs will play a larger role at ACT Expo. Alternative Clean Transportation (ACT) Expo and Electric Drive Transportation Association (EDTA) have formed a new event partnership for 2015 ACT Expo, taking place May 4-7 in Dallas. The partnership signals a renewed focus on the rise of electric vehicles; it’s one more significant step that event manager Gladstein Neandross & Associates (GNA) has taken to expand the fuels and technologies being embraced by the clean transportation community. RFS gets an impressive list of supporters. A group of 33 state governors is asking the US Environmental Protection Agency to increase blending mandates for its soon-to-be-announced ruling on Renewable Fuel Standard volumes for biodiesel and cellulosic ethanol. The Governors’ Biofuels Coalition says that decreasing RFS volumes could hurt production of biofuels from waste products. Spiking gas prices is a scare tactic, UCS says. 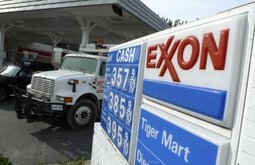 The Union of Concerned Scientists (UCS) says that the possibility of rising gas prices in California being warned by oil companies won’t take hold. With California’s cap-and-trade rule from AB 32 (California Global Warming Solutions Act) and the Low Carbon Fuel Standard coming from that legislation, oil companies are saying that with their increasing state taxes, they’ll have to pass that on to gas station pumps. A new report by UCS states that concerns about rising gas prices are overblown; the group thinks that any increases in transportation costs will be offset by savings from decreased oil consumption. What happened at Paris Motor Show? Green Car Reports traveled overseas for the opening of the famous auto show. Here’s their list of impressive debuts…… Citroen C4 CactusAIRFLOW concept car…… 2016 Ford C-Max……… Infiniti Q80 Inspiration concept….. 2017 Jaguar XE diesel…….. 2016 Mitsubishi Outlander Plug-In Hybrid…….. Renault Eolab concept…….. Volkswagen Passat GTE Plug-In Hybrid and Volkswagen XL Sport. USDA investing $91M in biofuel plant. Secretary Tom Vilsack said that the US Department of Agriculture is offering a $91 million loan guarantee to help finance an innovative advanced biofuel plant in Rapides Parish, La, with the Cool Planet corporation. The Cool Planet facilities will produce about eight to 10 million gallons of reformate per year at full capacity. Often referred to as a “drop-in” fuel, reformate is an ingredient in gasoline and jet fuel that can be added during the regular refinery process. Full-size Transit van on propane. Roush CleanTech will be offering a propane-powered Ford Transit full-size van to fleets by the middle of 2016. The Transit is in development now with Roush, and will be certified under Ford’s Qualified Vehicle Modifier (QVM) program. For the latest on the benefits of bringing propane autogas into a fleet, see a recent Q&A article by Michael Taylor, director of propane autogas business development at Propane Education & Research Council. Lamborghini enters EV space. Lamborghini announced at the Paris Motor Show it will roll out its first-ever plug-in hybrid vehicle. The Asterion LPI 910-4 concept car has a V-10 aspirated engine and three electric motors. The company said the Asterion can get 30 miles to the gallon on the lithium electric battery alone. Green Across America Trip #2. The compressed natural gas (CNG)-powered Honda Civic road trip across the country that started in 2012 by Evelynn Corbitt and Curtis Martin, national chairman for Green Across America, will make its run this month in coordination with Alternative Fuel Vehicle Odyssey Day 2014. There will be scheduled stops in Lynden, Renton, Portland, Lebanon, Eugene, Medford, Saratoga, Paso Robles, Santa Maria, Los Angeles, Long Beach, and San Diego. The road trip will be supported by Clean Cities coalitions in Washington, Oregon, and California, the National Alternative Fuels Training Consortium (NAFTC), and CNGChat.com. More propane conversion centers in Alliance AutoGas. Alliance AutoGas now has 100 member companies in its network with Virginia-based Better Fuels and Oklahoma-based CNG Interstate. CNG Interstate has traditionally specialized in compressed natural gas conversions for light- and medium-duty fleet vehicles and has become active in the propane autogas space.